Some stories are about small, simple questions: Will the guy get the girl, defeat the bad guys, and live happily ever after? There’s nothing wrong with that, as many of the best movies are precisely that simple. Then there are stories that are about great, unanswerable questions, not so much to produce a definitive answer but just to make us wonder: Why are we born? Why must we die? Where did we come from before all of this, and where will we go afterward? Why are we even here at all when everything must perish anyway? Haibane Renmei is firmly in the second category, and all the better for it because it tackles these huge questions in the context of a story that has all the simplicity of a children’s book. The simplicity of the story is deceptive, in a good way, because there is so much more going on inside it than a single viewing will reveal. The show also does not answer all the questions it brings up, and again I think that is both good and quite deliberate since only a fool or a saint would assume they had absolute answers to such questions. Like Wings of Desire, 2001, Night On The Galactic Railroad, or any of the other great works about man’s place in the universe, Haibane Renmei inspires more reflection than certainty. 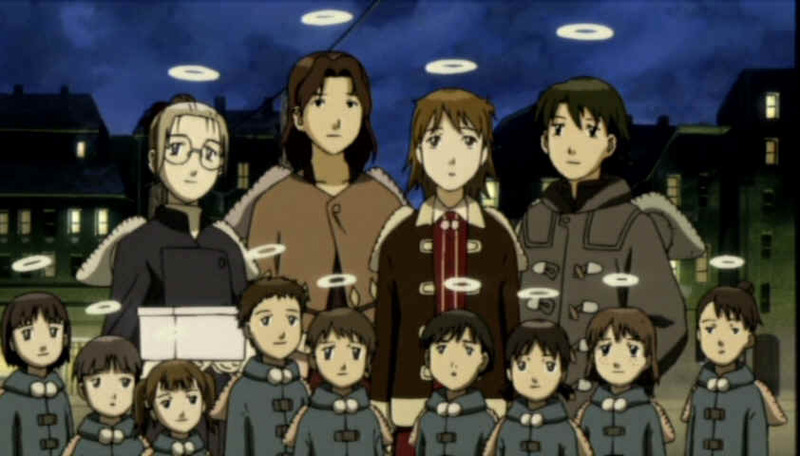 Haibane takes place in a town named Guri, which outwardly resembles one of the many towns in Middle Europe that have remained unchanged through the centuries, with many tall, older buildings brooding over the shorter, newer ones. Life is quiet and unhurried, the weather mild. The extraordinary thing about Guri is how many of the inhabitants are Haibane—young people who look and act human but have small wings and a halo, much like the classical depiction of angels. They remember nothing of their life before coming here but retain their personalities. The other odd thing about the town is that no one, human or Haibane alike, may leave—except, that is, for the mysterious Touga, the veiled traders who come and go through the giant wall at the edge of town and speak only in sign language. The story proper opens with the arrival of one particular Haibane—a young girl with perpetually messy hair, named Rakka (“Falling”). Like all the other Haibane, she “arrives” by being born out of a seed pod, a giant globule that just springs up out of the ground in one of certain buildings in town. When the pod bursts open, there are other Haibane there to receive her, to guide her into this world and help her learn her place. Like all the others, she’s confused and scared; she has half-remembered dreams from her time inside the pod. Dreams of—what, exactly? Her past life? Is this the next world, or something akin to it? 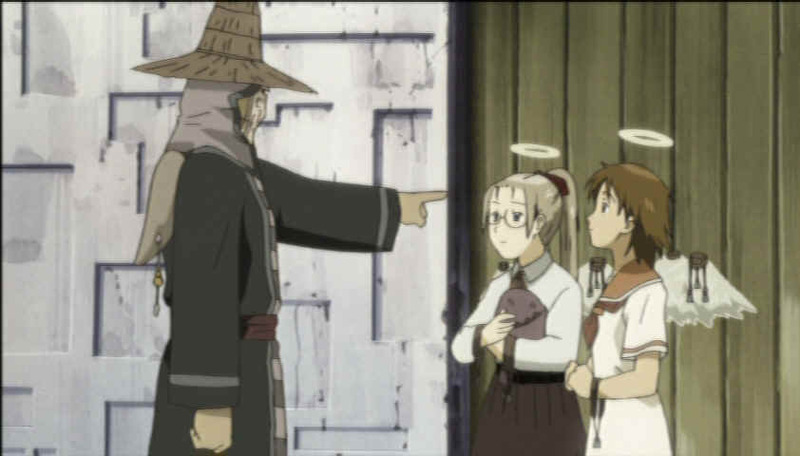 The Haibane live communally, with a loose hierarchy based on age, and a strict code of behavior. They cannot earn money for themselves; instead, they are given ration books to obtain used clothing and furniture with. They must work and make themselves useful, in the manner of penitents or medieval stoics. Some welcome their work; others shun it and find ways to have others make excuses for them. And every now and then a Haibane will feel a calling of sorts, and will be drawn out of the world just as abruptly as they were thrown into it, in a burst of light reminiscent of fireworks in slow motion — their “Day Of Flight”. No one knows where they go. Among the oldest of the Haibane is Reki (“Stone”), Rakka’s own minder, a somewhat distant and reserved woman—not bad, just somewhat closed-off. Even as Rakka slowly finds her place in this world, it’s Reki who remains an obstacle. For all of her solicitousness in return to the woman who helped her so much, Reki remains diffident, detached, even sad. Reki is a painter and engages in some of the moodiness that seems obligatory for artists in fiction, but there’s clearly more to her than that. We soon see how the story is at least as much about Reki, the veteran, as it is about Rakka, the newcomer. They are alike in that both have profound difficulties to overcome. With Rakka, it’s her feelings of helplessness and unworthiness, something she will overcome with care and discipline. But with Reki, it’s a sense of acceptance—something she still cannot feel as being real despite all she has done for her peers. She paints her pictures, guides the other Haibane, provides advice and perspectives … and yet, at the end, still feels hollow. Her bitterness seems to only have been made worse by Rakka’s flowering; doubly so when Rakka proves she can support herself without Reiki’s help. This provides the turning point for the story’s final acts, which I will not discuss here as they are best experienced cold. I have my own theories about what the Haibane are, and their purpose, and I would encourage you to skip this paragraph if you’d rather not know. As I read it, the town is essentially a kind of waiting-room in the afterlife, where those who have died too young to be judged in their lifetime have come to finish what was never properly concluded. 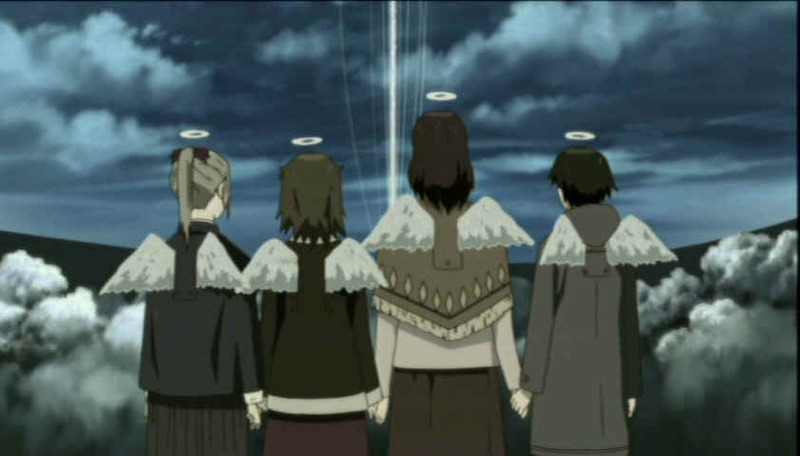 (This explains why the Haibane are all relatively young, even if they stay in Guri for quite some time.) Here, they can work to prove themselves as being worthy of ascending to the next world for real. Those that do not suffer a fate described in the story itself: they lose their wings and haloes, and become one of the Renmei, the watchers at the edge of town who guard against any save the Touga from leaving on their own. Reki’s greatest fear is not just that she may be doomed to become a Renmei, but that no amount of good work from her can change that — that she has squandered too much of the time she was allotted in this new world, hiding inside herself, spurning the help of others. Haibane was created by Yoshitoshi ABe [sic], the same man responsible for the look-and-feel of the remarkable Serial Experiments Lain, the enjoyably oddball NieA Under 7 (directed by Tomokazu Tokoro, also of this project), and the nihilistic but also gripping Texhnolyze.Haibane is somewhere between the otherworldly concerns of the first and the goony everyday drama of the second. His artwork here is simple but lovely, evoked more for mood and texture than detail, and his storytelling is similarly unobtrusive. He trusts his story enough not to force its hand and doesn’t indulge in gimmickry—save for the surreal moments at the story’s climax, which are part and parcel of what’s going on. The show develops in an unhurried way, sneaking up on the viewer, building its case casually, and by the end, it becomes moving and not just a curiosity or a showcase for a design style. One aspect of the show I once considered a flaw no longer seems as much of one. 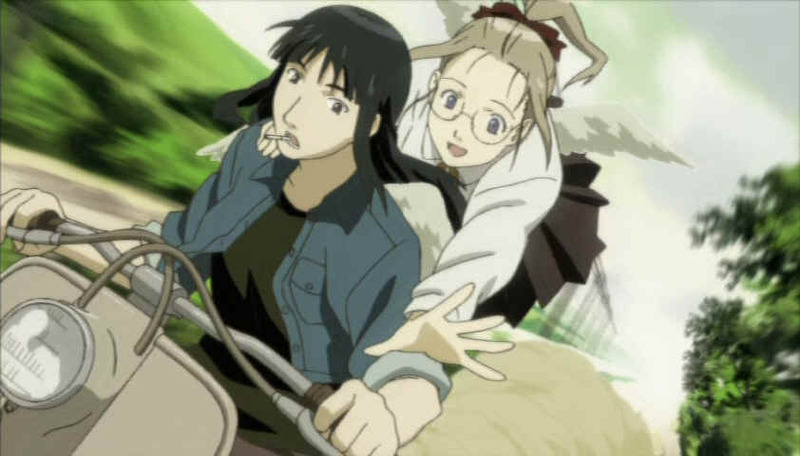 Haibane originally appeared in 2002, when 26-episode, or “two-cour“, seasons of anime were more the norm. This one clocks in at only thirteen. I originally felt the wrap-up in the last few installments seemed terribly rushed, as though they had planned for more and weren’t allowed to continue. 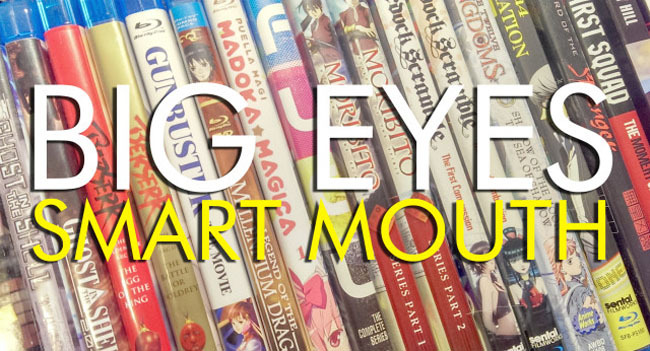 But that was before more single-cour shows came along, as an alternative the OVA format, and demonstrated that a tighter focus and a smaller scope, even when you have an abrupt ending (see: Princess Jellyfish) are not bad things. A longer show, in this case, might not have turned out to be a better one or a more complete one, merely a longer one. Another by-product of this shorter format and abrupt ending is a greater aura of mystery placed over the whole, which does nothing but aid its aims. 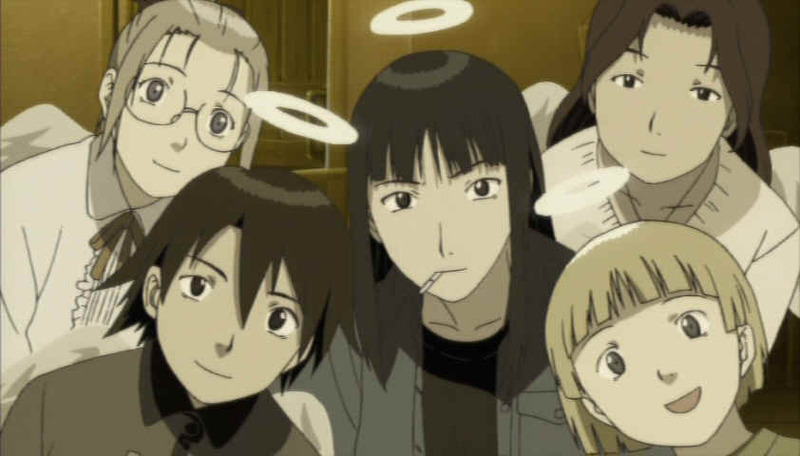 When shrouded in that kind of flavor, Haibane comes to seem less like an allegory for one possible afterlife and more like an allegory for life itself. We come into this world unbidden; we exist for a time and do our best; and then, just as abruptly, we leave. Why? No why, the show seems to be saying; life is just like that. We may have theories and explanations for why, but in the end, they remain only that, theories and not the actual thing itself. Besides, what matters is not that we get absolute answers to our great questions about life, but that we ask the questions in the first place. The answers for everyone will always be different. The asking is what matters most.